Our in-depth research on fashion trends allows us to offer an exclusive assortment of Super Net Printed Saree that remains same even after washing several times. 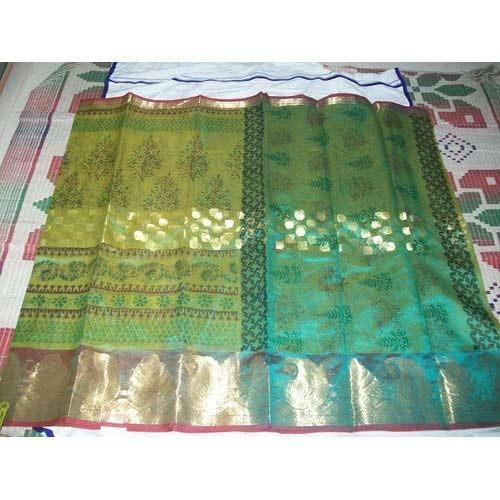 The offered printed sarees is precisely designed by vendor’s adroit designers utilizing premium quality fabrics and sophisticated techniques in accordance with market trends. Also, clients can avail the offered printed sarees in customized options so as to meet the need of customers. Established in the year 2005, our organization was founded under the banner of Kamakshi Collections as a prime trader and supplier of an undisputed range of Pure Silk and Cotton Sarees. We gained a position of repute due to the unfaltering supply of our diverse line of products that include Pure Silk Sarees, Cotton Sarees and Policot Sarees amongst an array of varying products. Our priority rests in providing our clients with the finest products that the industry has to offer. We pay extra attention to the pertaining needs of the clients to facilitate customized solutions to each of their demands via maintaining constant communication. We serve our clients with utmost humbled nature and practice ethical business to ensure mutually beneficial business associations. Our organization was founded upon an industrial upholding of infrastructural excellence. We have stationed various departments within our roof to facilitate the easy functioning of work under an organized chain of command. Our employees work within these divisions to lend their expertise for smooth flow of productivity. Our products are distinctive for their consistent quality and durability over long periods of time. Each product is made from fabrics that are either procured from the most trusted vendors or extracted using intricate methods. Our sarees are made from multiple layers of weaving fabric yarn to produce smooth and awe striking features.